Energetic Lighting’s E2HBD series LED “value line up” commercial 2-4ft linear highbay fixture provides a quick and easy solution for warehouse and industrial applications. 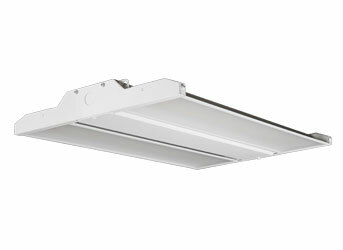 The linear profile allows for a one-for-one substitution to existing linear fluorescent highbay fixtures where the original chain suspension hardware can transfer directly over for ease of install. Available in 65W, 110W,162W, 225W, and 321W variants, designed to replace traditional 250W-400W T8 fluorescent equivalent highbay fixtures. Constructed out of steel to provide a strong housing structure and as an integrated thermally efficient heatsink profile, each fixture is rated for a minimum L70 of 50,000 hours. Standard polycarbonate diffuser provides reduced glare and even illumination. Dimensions 24.5"x15"x2.5" 24.5"x15"x2.5" 24.5"x15"x2.5" 46.5"x15"x2.5" 24.5"x15"x2.5"